We have our own boat launch and have 10 deep water boat slips that rent for $10.00 per day or $65 per week. There is a charge of $10 per day to launch and park for drop-in fishing. If you are staying with us in the cottages, motel or rv site, there is no charge to use the boat launch. During ice fishing we charge $5 per day to park. We keep the parking area plowed for easy parking. 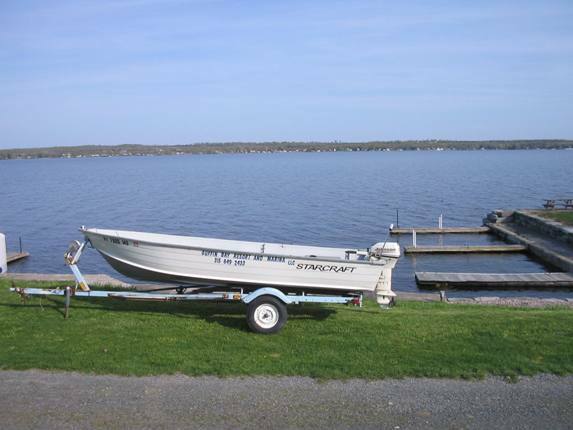 Guffin Bay Resort also offers a full line of engine repairs on both inboard and outboard engines, fiberglass or aluminum structural or non structural repairs, and boat trailer repairs. We also do installation of radios or GPS and fish finders. Check out our Rental boats below... Boat rentals are limited to our Cabin and Motel customers only. If you are not staying here with us you cannot rent a boat. This is our 16 foot Starcraft rental boat with bimini top, fishfinder and 15 hp Johnson motor. Boat and motor is a 2005. This boat rents for $60 per day and $350 per week. Fuel is extra. 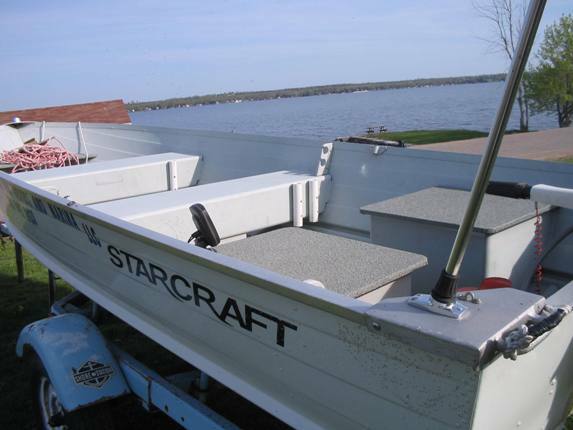 16 Foot Starcraft fishing boat rental.